“So our meeting here is fate? asks the old man. “Maybe,” says Janosch. And maybe it’s just bad luck. I’m sixteen years old. Life goes on, And on. And I don’t want people who are farther along telling me how the whole thing goes. I had to get through the last sixteen years without you and I’ll probably have to get through the next sixty-five years, god willing, without you as well. So just leave me alone. It’s great that you can sing the song of life, so go take it to an old-age home and teach it to the residents! They’d be thrilled! But leave me to get on with it too. Everything’s bad enough as it is. We’ve just run away from boarding school. And I think we’re going to need what’s left of our youth. Go peddle your crappy song somewhere else!” Janosch’s eyes are slits. He’s really mad. … And sometimes, it’s best not to know the song of life. Yet again, Janosch says it like it is. Youth is about discovery; it’s about occasionally hitting the wrong note, making mistakes. And there is no such rule that there is only ‘one’ song of life. Everyone makes their own song, dances to their own tune. Janosch’s frustration is totally understandable. Sometimes all a teenager ever does is fight against other people’s songs; where life is one big fight to find what is right for you. ‘Crazy’ Best Bits II | What is Literature? “So what are you reading?” Janosch asks. Another life-enhancing dialogue between young teenage philosophers, Janosch and Lebert, this time trying to figure out the meaning of ‘literature’. And I’m glad to say, they get it spot on. Real literature carries inside it the lining of life. Something lived, something tasted, something suffered. Lebert sums this up with a grace beyond his years. ‘Crazy’ Best Bits | Are You Afraid of Death? “Are you afraid of death?” I ask Janosch. “No one who’s young is afraid of death,” he says. “So why am I afraid of death?” I ask. “It’s something else,” says Janosch. “With you it’s the sea,” says Janosch. Janosch pulls on his cigar. I look up at him. I admire him. I’ve never said it to him, but I admire him. Janosch is life. He’s light; he’s the sun. If there is a God, he talks through Janosch. I know it. And he should give him his blessing. Some of the best bits from the novel. This is a dialogue between Benni and Janosch, discussing the finer points of what it feels like to be a teenager heading straight for nowhere. 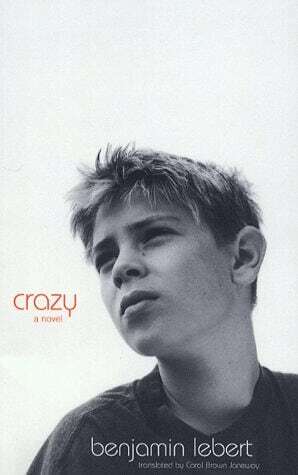 Benjamin Lebert‘s debut novel ‘Crazy’ was first published in 1999 in German. It’s initially a coming-of-age story about young sixteen year olds who are on the brink of ‘growing up’ . The story itself is set in the grim Castle Neeseulen Boarding School, where teenagers of different backgrounds are gathered together for one final chance of improving their grades. When Benni first joins Neeseulen, the only problem he has is how to get his math score from a 6 to a 5; but as the term goes on, Benni finds himself an unlikely member of a motley crue, who between climbing fire escapes in the middle of the night, drinking everything in sight and screwing around a little also ponder the meaning of life along the way. Oh, by the way… Benni is also a cripple. Written from personal experience, Lebert manages to weave many thought-provoking questions into the novel. There is the painful embarrasment of partial paralysis written from a humorously optimistic point-of-view, that sharpens rather than masks how alienating the condition is, especially in a boarding school environment. Then there are the pains of growing up, the concept of ‘manliness’ and the issues of innocence lost. At moments, it is funny, yet under all the fooling about, lurk some important questions about life, love, childhood and adulthood. “Hi folks, my name is Benjamin Lebert, I’m sixteen, and I’m a cripple”. Amazingly, this is how Lebert introduces himself for the first-time to his classmates at Neeseulen. Leberts’ novel starts off pretty simple, but by the end of it, I grew so attached to the characters, that I wanted to read it all over again. Lebert highlights the importance of friendship during the stormy teenage years – how memories are made, and how ‘crazy’ the whole experience actually is. The boarding school life he recounts isn’t at all attractive. One gets a sense of the aimlessness of the children, the loss or lack of their parents, and the desperate ways in which they try to fill that void. I agree with the comparison that it is much like ‘Catcher in the Rye’, with one difference: this is more accessible. The pessimism is not so heavy with Lebert, even though he has every reason to be so (being partially paralysed). He stands out as the optimistic one of the group, and through his eyes you begin to see how these children, (who come from broken homes and families) all find something to be grateful about. A good read, and an excellent debut novel for a young author.